In June 18, 2009, NASA’s Lunar Reconnaissance Orbiter (LRO) spacecraft was launched to orbit the Moon. Its mission is to gather data for planning NASA’s future human and also robotic missions to the Earth’s natural satellite. 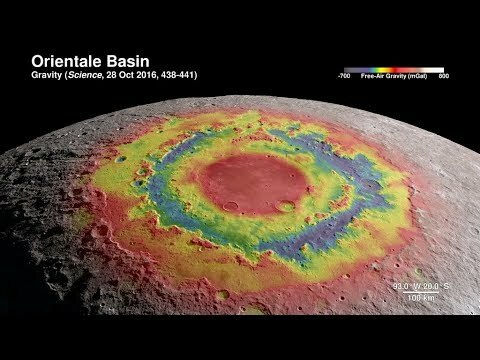 The following video is a virtual tour of the Moon created from data it (the LRO) has collected since 2009. The Lunar Reconnaissance Orbiter orbits the Moon from 50 km (31 miles) above the surface, at a speed of 1.6 km per second (1 mile/s). It needs about 2 hours to make a full orbit. Its weight is almost 2 metric tons (1,916 kg / 4,224 lb). The Moon’s distance from Earth is 384,400 km (238,855 miles), that distance increases by about 4 centimeters every year. Because its mass is way smaller than the mass of Earth (therefore it has a much lower gravity), you would feel like flying while walking on it. You would actually fly for several meters just by jumping forward (without a heavy suit). Its temperature differences (in relation to Earth’s) are also extreme: When there’s sunlight on its surface, the temperature can reach as high as 127 °C (degrees Celsius) or 260 °F (degrees Fahrenheit). When there’s no sunlight, surface temperatures can go as low as -173 °C (-280 °F). So, in other words, you body would literally boil in the Moon’s day, and literally freeze in its night.